Region: North central United States and in parts of the south and east. Life cycle: One generation is produced each year. 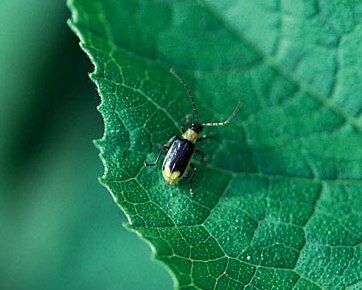 The beetle overwinters in the eggs stage and the larvae appear in spring, pupate in the soil in early summer, and emerge as adults in the middle of summer. Physical Description: This 1/3 inch, fast moving beetle is bright green to yellowish green and occasionally has a brown head and pronotum. Its eggs are yellow and are laid on the ground near corn roots, while the larva is 1/2 inch long, thin and wrinkled white worm with a brown head. Feeding characteristics: As adults, the beetle will chew on corn silk and eats the pollen of other plants. 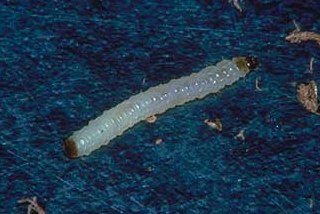 As larvae, it will burrow into roots in early summer and do a great deal of damage. Controls: To control the grubs, use crop rotation.